Lately I've been very moody when it comes to the people around me. I am moody in the office especially if I know that there are a lot of things to do in a short period of time. I am moody at home and keep some blaming other people for my shortcomings. I am especially moody when it is a weekend and because I have to be at our store and help I wasn't able to do the things that I was supposed to do that primarily concerns this blog and my other blog, IzzaGlino. My mind is in beautiful mess. I always feel like I have to do a task but when it is time for me to do the task, I will procrastinate and do social media, watch Detective Conan on my Ipad and so on until I realize that I haven't anything at all. I need to find Mr. Clarity. 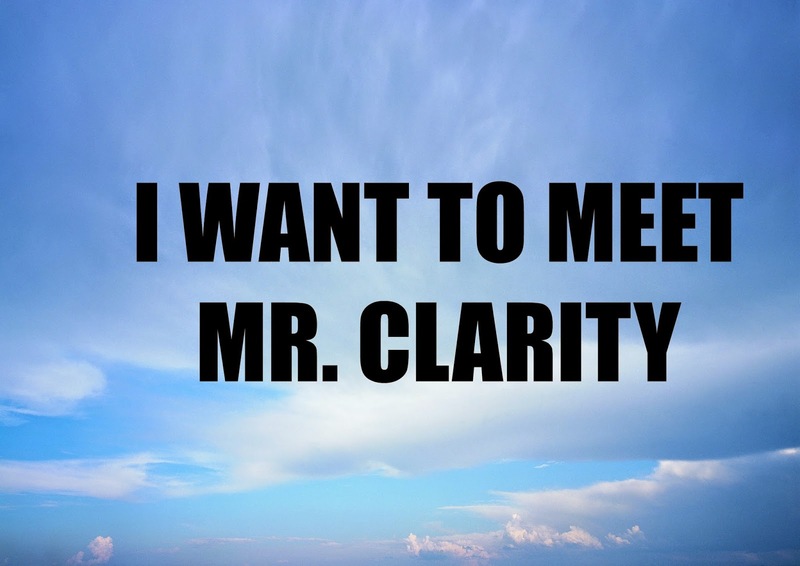 Clarity means the quality or state of being clear, being easily understood and expressed. It could also mean a very exact way. 1. Clarity on what I really want in my life. I have written and self-reflecting post about this but yes, finding out what I really want in my life has been a constant battle. It is as if every day my mind and my heart is changing. 2. Clarity in my commitment with God. I find it hard to spend quality time with Him for weeks now. I know how important it is to meditate in God's word as a Christian and I just really want to have this clear intentions over my faith and reassure that I put Him on top of my priorities. 3. Clarity in my goals. I have a whole lot of goals set for 2015. I even had a sudden change especially in my investment must haves thus my financial goals were hit too. There is nothing more important to me at the moment than to achieve them goal by goal by goal. Want to clear and on point on what goals must be achieved and those that are becoming more of a hindrance due to too much procrastination. 4. Clarity in my blogging. Both IzzaGlino and SavingsPinay are equally important to me. As much as I want SavingsPinay to succeed I will be more happy if I see the views on my other blog, IzzaGlino, become better too. I actually am thinking whether to put the beauty and lifestyle blog with this blog together but I don't want to ruin the identity of SavingsPinay as a personal finance blog. Anyhow I guess I just have to continue giving excellent posts on my other blog. 5. Clarity on my finances. I've been overspending too much and I knew I have to stop. I also became too obsessed in buying books!!! I spent about 500pesos twice in my book shopping which is totally out of my monthly budget. I knew I need to focus more in dealing with sudden financial urges that could really ruin my budget big time. 6. Clarity on my morning and evening routines. I've discussed on my 14 Day Productive Living eCourse the value of a perfect routine. Mornings and evenings should be spent productively. I have written how I mostly want to spend my morning and evening in my Ideal Week Template but I'll probably write an updated one soon. 7. Clarity in what I do and what I do. I knew I have to be more intentional in my actions. No more procrastination and instead act right away in my to do's. I also have to plan before taking action so that everything that I do will just be according to my goals. I also have to think clearer and constant idea dumping really helps with this one. I need to find Mr. Clarity and I am all set and ready to find him. I just wish he'll show up sooner. How about you?! Are there areas in your life that in need of Mr. Clarity? !